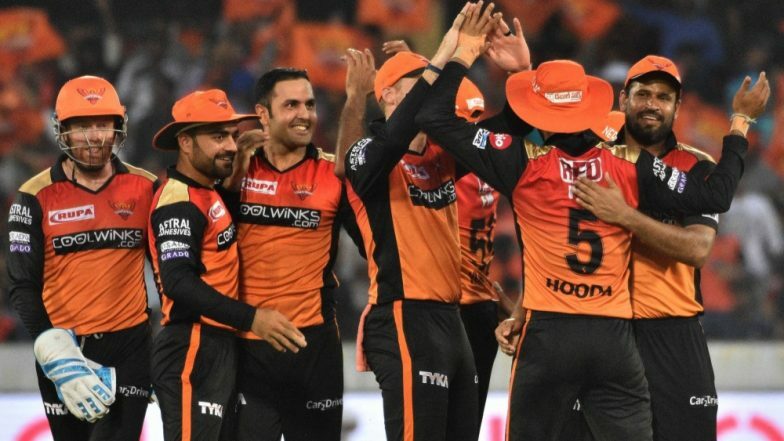 Sunrisers Hyderabad (SRH) is all set to play against Mumbai Indians (MI) in the match no 19 of VIVO Indian Premier League (IPL), 2019. The match will be played at Rajiv Gandhi International Cricket Stadium, Hyderabad. SRH shares a video of their players wishing Happy Ugadi to their fans ahead of their clash with Mumbai Indians. Ugadi is the new year day for the people of Karnataka, Andhra Pradesh and Telangana states in India, which is being observed on April 6, 2019, in these regions.SRH vs MI, IPL 2019 Match 19, Key Players: David Warner to Hardik Pandya to Rashid Khan, These Cricketers Are to Watch Out for at Rajiv Gandhi International Stadium. SRH after facing defeat from Kolkata Knight Riders (KKR) has come out strong, by winning three games in a row. They played their last match against Delhi Capitals, in which they chased down the total of 129. In the below video you can see SRH players Jonny Bairstow, Yusuf Pathan, Vijay Shankar, Bhuvneshwar Kumar, Mohammad Nabi and Siddharth Kaul giving Ugadi wishes to fans. Sunrisers Hyderabad vs Mumbai Indians Live Cricket Score 19th T20 Match. There is a big mystery over SRH player Kane Williamson presence in the upcoming game against MI. His absence will mean that Bhuvneshwar Kumar will again lead the Hyderabad side. However, Sunrisers Hyderabad currently has perfect playing XI with all players contributing well. SRH spinner has Mohammad Nabi has been a star in the previous two games, where he had bagged a total of 6 wickets. The Afghan star even batted well in the last game against Delhi Capitals to help his team win in a pressure situation. He played a short cameo of unbeaten 17 runs from 9 balls.